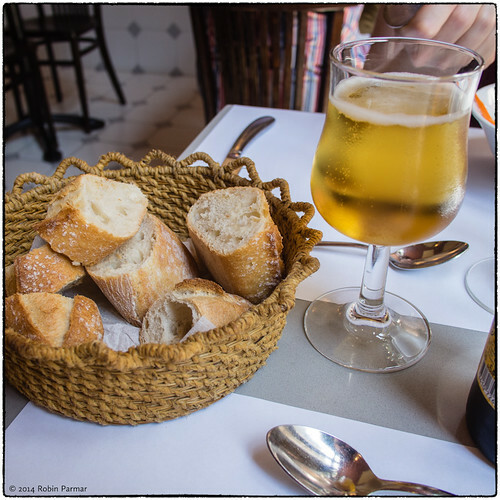 It's time for a quick restaurant review, through photographs. This July I was lucky enough to be in Barcelona for a week. 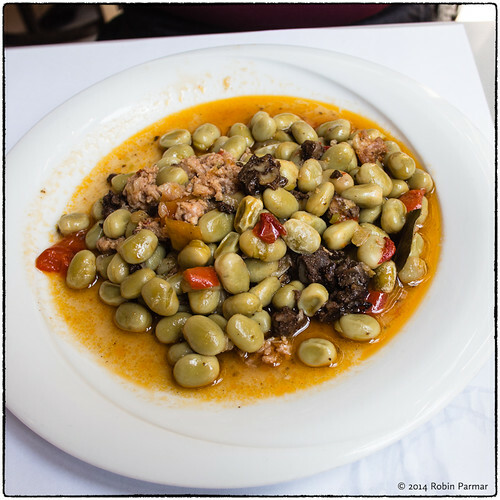 So many events stand out for me, including a fantastic lunch at L'Antic Forn, a place where the waiters are attired in white aprons and everything is just so. Barcelona can be expensive, but it has a tradition of "menu del mercat", where you can eat a filling lunch for the price of a single dinner item. Susannah and I did just that, picking the place randomly after a short walk in Raval, near her apartment. L'Antic Forn means "old bakery", which is pleasing from the get-go. Bread is essential. Crusty, fluffy white rolls that go stale in a couple of hours, so you know they are not made with junk. That's something I cannot get in Ireland, so I do not eat bread when at home. Now, I have an odd habit I sometimes indulge. On those rare occasions when I am in a fine restaurant, I might order items that I know, from experience, that I do not like. This way I can test my palate against exemplars of these dishes. 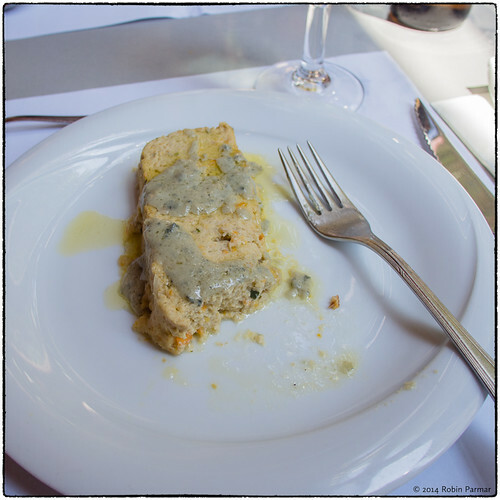 As an example, my starter, "pastel de pescado y verduras con salsa roquefort". This was not a pie but a salmon mouse, redolent with sea flavours and quite salty. It's far too rich a dish for me. Likely excellent! 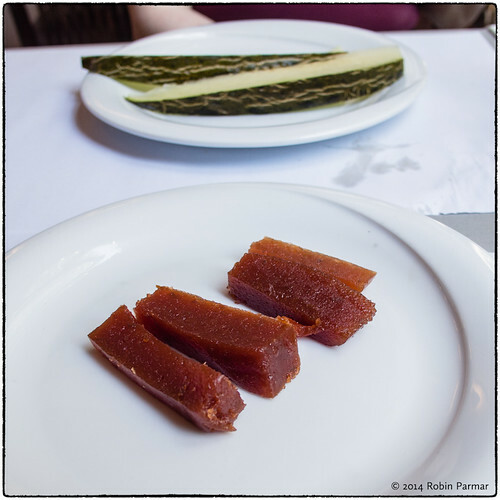 Susannah had the "habas guisadas a la catalana", where "Catalan" generally translates as "with various internal organs of the pig we happened to have in the kitchen". This dish included morcilla (black pudding) and something else -- I can't be more specific than that (and sometimes it's better not to know). It was amazing; perfect country food. 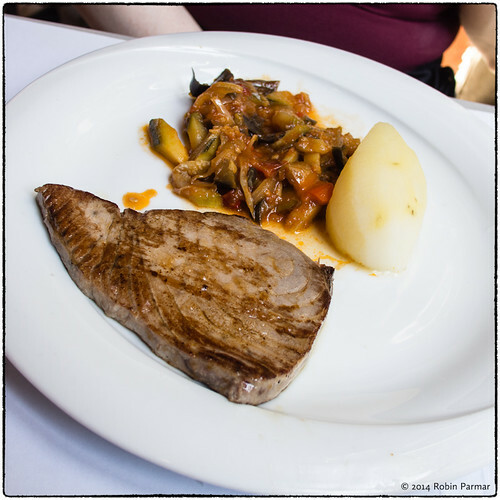 Susannah followed with "filete de atun plancha con guarnicion", which in description leaves the sides to the chef's discretion. On this day it came with plain boiled potato and a wonderful ratatouille. My preference for grilled tuna is to have deep steaks raw inside. But that is not the European tradition, and for this style of preparation there was no faulting the fish. My own selection was something I have eaten perhaps once before: "pies de cerdo guisados con jamon". 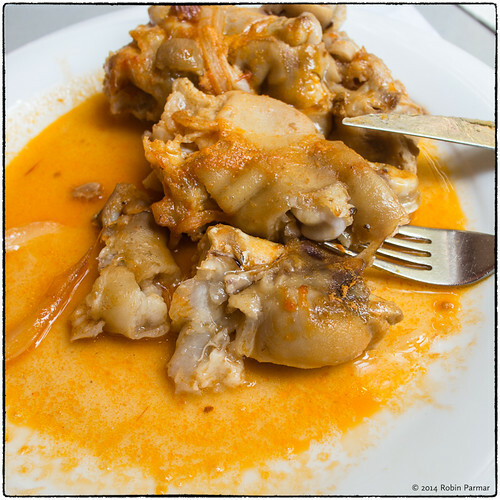 The glutinous texture of the trotters is not something that is very appealing, but the subtle stewed flavours were spot on. I don't recall the other options, but we had sliced melon and quince compote for dessert. Quince is extremely sweet; this amount would sink a ship. I ate half. Lunch included "bufet de ensaladas", a drink (wine, beer), and coffee to finish. That's five courses, as these things are usually counted. For 13 Euros. Never have I had a finer meal for less. I thoroughly enjoyed Susannah's options and revelled in the luxury of my own perverse choices. It was an absolutely fantastic experience. For authentic Catalan food in perfect ambiance, I recommend L'Antic Forn, located on a corner at 28 Carrer del Pintor Fortuny.